Andrea Riseborough discusses the decision to hire all female department heads on ‘Nancy,’ and the need for more films about flawed, imperfect women. Larry King: You’re working on a new film called ‘Nancy,’ that has all-female department heads. You mean everybody behind the scenes is female? Andrea Riseborough: Yeah I think we had like 35 vaginas and 3 men. Larry King: 35 vaginas and 3 men? Larry King: [chuckles] Who is Nancy? 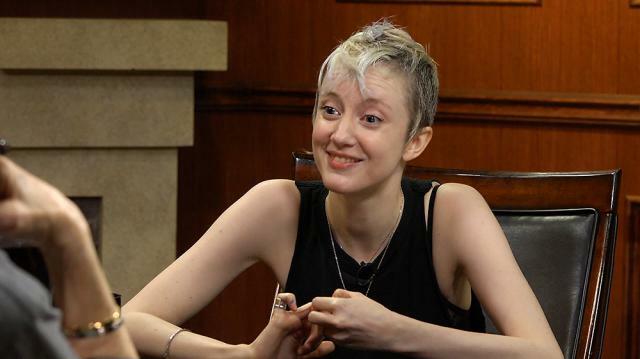 Andrea Riseborough: I met a director, Christina Choe, who’d made a documentary about North Korea a few years ago, and she’d written this script called ‘Nancy’ which had this antihero—which I kinda resent, the term ‘antihero’—but this female character was an antihero, who lives an almost hermetic life with her mum. Think hoarder, copies of ‘National Geographic,’ her mother, very depressing situation. She’s a little older than I am, but she has this sort of childlike spirit and is a compulsive liar, meets men through miscarriage websites. All of that’s a lot of information, but after the election, Christina wrote a beautiful statement, director’s statement, when we were trying to get the last of the money together, and I’d brought Barbara Broccoli onto the project maybe about six months before that, and we needed the final push for an extra bit of money. Larry King: There have been occasional stories of imperfect women. Andrea Riseborough: Yeah, occasional ones. Larry King & Andrea Riseborough: Not enough.